The Lam-rim, or graduated path to enlightenment, presents all the stages of the path to awakening as taught by the Buddha in a systematic manner. Songs of Spiritual Experience, by Lama Tsongkhapa, is renowned as one of the shortest of the Lam-rim texts. In this text, Lama Tsongkhapa introduces the stages of the path with respect to practice, describing his own experiences as a yogi in relationship to each of the meditation topics. This is an opportunity to deepen our understanding of the Lam-rim and receive instruction from a master of both scripture and practice. We are pleased to have Geshe Ngawang Dakpa return to Ocean of Compassion and give a commentary on this very precious text. 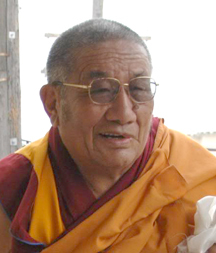 Geshe Dakpa is a renowned scholar of the Gelug tradition, having received the traditional geshe degree from Sera Monastery. His wisdom, warmth and incredible ability to present the teachings to westerners in a traditional, yet lively way make him a jewel to those who have had the fortune of studying with him. Your donations help support programs like these to continue.